Just two decades ago, the discovery of the first planet orbiting another Sun-like star was announced, and we entered the 'exoplanet era'. In the years that followed, more such planets were found. First in a trickle, then in a flood. This explosive growth culminated in an astonishing announcement this May from the Kepler science team. 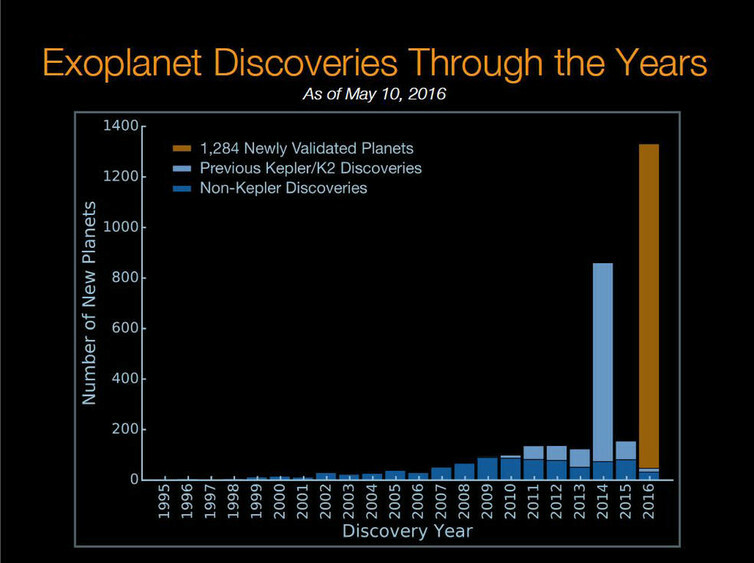 Another 1,284 exoplanets were added to the catalogue. As a result, more than 3,000 other worlds have now been found. Despite these successes, finding planets is hard. With few exceptions, we cannot see them directly. Even with the largest, most powerful telescopes, they remain lost in the glare of their host stars. Instead, astronomers must become detectives, and search for clues that reveal the presence of unseen worlds. Most of the exoplanets found to date have been discovered by two key methods: either watching stars to see if they wobble, or to see if they wink. During the first decade of the exoplanet era, the most successful technique was the radial velocity method. Here, astronomers take the light from a star, and break it into its component colours. Across this spectrum are dark lines, which are the fingerprints of the atoms and molecules that make up the star’s outer atmosphere. The locations of these absorption lines are known with exquisite precision and must occur at a specific wavelength. If the star is moving toward us, however, we observe the lines to be slightly blue-shifted, and if it is moving away, red-shifted. The faster the motion, the greater the shift. This gives us a tool by which we can find planets. If a star has a companion (be it a planet, brown dwarf, or star), the two will orbit their common centre of mass. The bigger object will follow the shorter route, and the smaller one, the longer. So a star with a companion will move back and forth, with one full oscillation per orbit. Since the star and companion lie at opposite sides of their centre of mass, the period of the star’s wobble is the time it takes its partner to complete one circuit. The closer the companion’s orbit, the shorter will be its period, and the faster the wobble. The more massive the companion, the greater the wobble’s amplitude. So by tracking a star’s wobble, we can determine a planet’s orbital period and distance, and get an estimate of its mass. Of course, this isn’t without limitations. The surfaces of stars are turbulent, rising and sinking like boiling water, and are plagued with spots and imperfections. These introduce noise to the spectra, often masking the tiny signals of any planet-induced wobble. And those wobbles are tiny. For an alien observer to detect Earth, they would have to be able to measure the Sun’s velocity changing by just under 10cm/s (0.1m/s), over the course of a year. A hot Jupiter, in contrast, would induce a much larger wobble on a Sun-like star of greater than 50m/s. To make things worse, the longer the orbital period, the longer they would have to observe to capture at least one full wobble, to be sure they have a planet. For this reason, the radial velocity technique requires a slow burn, following a few individual stars to watch wobbles that can take years, or decades, to complete. In recent years, the transit method has taken over as the most successful means of finding exoplanets. Here, astronomers carefully monitor the brightness of thousands of stars, watching for the wink that occurs if a planet passes directly between its host star and us. A transit will only occur if the orientation of a planet’s orbit is just right, causing it to pass in front of its star with every orbit. The closer the planet to its star, the more likely this perfect configuration will be. As a result, this technique is biased towards finding short period planets. Despite this shortfall, the method has been immensely productive, with more than 2,500 planets discovered to date. As with radial velocity observations, the transit technique allows us to learn a little bit about the planets it reveals. By observing multiple transits, we can determine a planet’s orbital period and thus its distance from its host. 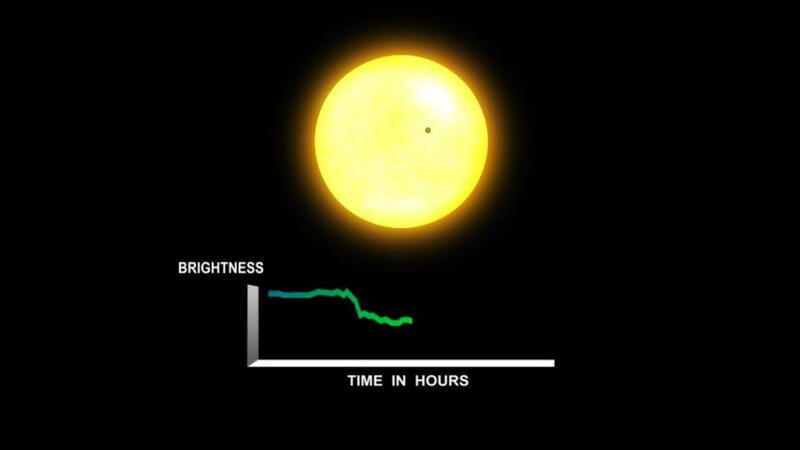 By measuring the fraction of the host’s light blocked during a transit, we can determine the planet’s physical size (relative to the star). Bigger planets block more light than small ones. For this reason, the technique is also biased towards finding bigger planets – their transits are easier to spot against the noise of the star’s activity. We can also determine, from the transits, the tilt of the planet’s orbit to our line of sight. This is particularly useful if we wish to follow up the discovery to learn more about the planet by other means. Winks and wobbles: 97 percent. What about the other 3 percent? Of the nearly 3,300 exoplanets known to date by NASA, 3,170 were found by either the radial velocity or transit technique. But what of the others? While the radial velocity technique and the transit method have dominated exoplanet discovery, they are not the only tools that have been used. The other 3 percent of known planets were found by a variety of different means ranging from direct imaging, to making use of one of the quirks of General Relativity. The search for planets around other star systems has been going on for decades and the results are now coming in thick and fast. This series will look at some of the techniques astronomers use to find these exoplanets. In our next article, we will describe other methods that have helped complete our current exoplanet catalogue, as well as discussing the future of our search for other worlds. Jonti Horner, Vice Chancellor's Senior Research Fellow, University of Southern Queensland and Brett Addison, Postdoc astrophysicist, Mississippi State University.